Welcome to Christmas Day, NFL style! In just about nine hours, our annual summer nightmare of no football ends as the Seahawks and Packers face off in the always-interesting Thursday Night NFL Opener. Only the most negative person would have a complaint about the start of the NFL season, and here it is: We have to wait a little more than 60 hours for more football after tonight’s game ends. That blows, but I’m not going to let it get me down. Soon enough our senses will be overloaded with nonstop Sunday football. We’ve been pumping out article after article of NFL previewy goodness over the past couple weeks, and now it’s time for our final preseason post. Neil and I have staked our claims to each team’s win-loss record (with a ridiculous bet to back it up) and we’ve gone through all the individual accolades. 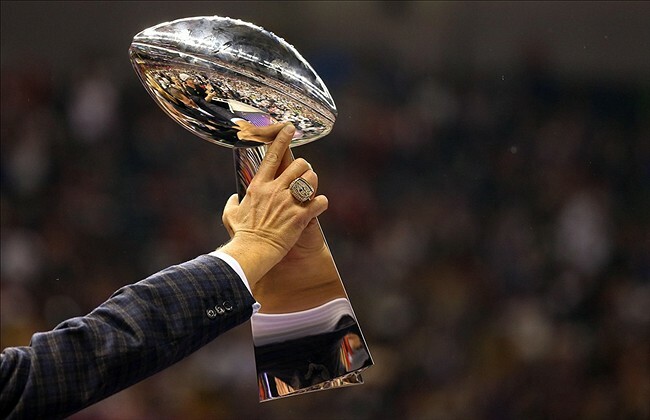 We’re moving on to the only thing that truly matters, which 12 teams make the playoffs and who’s left standing in Arizona on February 1st, 2015, hoisting the Lombardi Trophy. Neil will take you through his seedings and rationalizations first, and then I’ll finish her off. (5) San Diego over (4) Pittsburgh – San Diego is probably the 3rd best team in the AFC this year. (3) Houston over (6) Cincinnati – We’ve certainly been here before. (5) Chicago over (4) NY Giants – Part 1 of the “NFC North is way better than the NFC East” invitational. (3) Green Bay over (6) Philadelphia – Part 2. (1) New England over (5) San Diego – The Chargers are not going to New England in the middle of winter and beating Belichick and Brady. (2) Denver over (3) Houston – Not even Houston’s defense can overcome Fitzy in a road playoff game in Denver. (1) New Orleans over (5) Chicago – I do not think the Chicago defense is going to be good enough to go into New Orleans and win a playoff game. (3) Green Bay over (2) Seattle – The Seahawks finally get too cocky, and Green Bay gets some revenge for the replacement ref debacle. (2) Denver over (1) New England – REVERSE JINX ALERT! REVERSE JINX ALERT! (1) New Orleans over (3) Green Bay – I think these teams are actually fairly equal, but New Orleans has a huge home field advantage. (4) Indianapolis over (5) Denver – DREAM MATCHUP! CAN MANNING WIN AS THE VISITOR IN INDY? Remember that last year was the exception in Peyton Manning’s career. Time to get back to the rule: Manning puts up great numbers in the regular season, but the Broncos bow out early. After all, the guy’s only made it to four Conference Championships in 15 years of playing. (3) Pittsburgh over (6) Miami – This game will get hyped as the “Mike Wallace Revenge Game” by absolutely no one. The Steelers have 100% of the playoff experience between these two teams. They win, and the Pouncey twins wear t-shirts showing their support of ISIS. (3) Philadelphia over (6) Tampa Bay – This could actually be a bad matchup for the Eagles if these two teams turn out how I think they will. But I’d never bet on Josh McCown or Mike Glennon in a road playoff game. (1) New England over (4) Indianapolis – I was listening to Grantland’s football podcast featuring Bill Barnwell & Robert Mays yesterday, and one of them mentioned that the Patriots aren’t that dominant at home anymore. For anyone who reads this that also heard that comment, I’d hate for you to think it’s true. The Patriots are 41-6 at home over the past five seasons (including playoffs). That’s a long-winded way of saying the Colts don’t have a prayer. (3) Pittsburgh over (2) San Diego – Mini-upset. People like me hope for the Brady-Manning throwback game, but instead we’re getting the Brady-Roethlisberger semi-throwback game in the next round. (1) New Orleans over (5) Green Bay – If these teams are evenly matched otherwise, the home field advantage and the GIGANTIC mismatch at Head Coach swings this game New Orleans’ way. (3) Philadelphia over (2) Seattle – Chip Kelly returns to the Pacific Northwest with a futuristic offense, the only kind that can beat the Seahawks at home. (1) New England over (3) Pittsburgh – The Pats have beaten Pittsburgh in two of these games on their way to Super Bowl wins in the past. I’m ready to live 2004 over again. (3) Philadelphia over (1) New Orleans – I don’t have a good reason for this pick other than the bet I made in Vegas six months ago on Philly to win it all. New England 34, Philadelphia 31 – A perfect hedge. New England wins and it’s the greatest moment in Boston sports since the 2004 Championship Red Sox. The Eagles win and I get a nice payday while also looking extremely smart for picking the Super Bowl winner 11 months in advance. All along I was thinking Brady vs Brees, one of the few marquee quarterback matchups that we’ve never seen in the playoffs. But #1 vs #1 is so last year. Over Labor Day weekend I went on a 25-mile backpacking trip on the Lost Coast Trail in Northern California. So you can understand that I’ve never thought about a single point spread in my entire life as much as I thought about this opening game (lots of thinking time while setting the world record in the quickest blisters to ever form category). I came to one conclusion: If Seattle’s favored by more than six, I’m taking Green Bay. If Seattle’s favored by less than six, I’m taking them to cover. The line lands exactly on six, perfect. I think it’s far more likely that the Seahawks are still a significant level above a team like the Packers than it is that Green Bay’s closed the gap enough to cover less than a touchdown on the road in the Super Bowl Champ’s opening game. I’ll be back on Friday with the rest of the week 1 picks. Enjoy the Richard Sherman over saturation tonight!